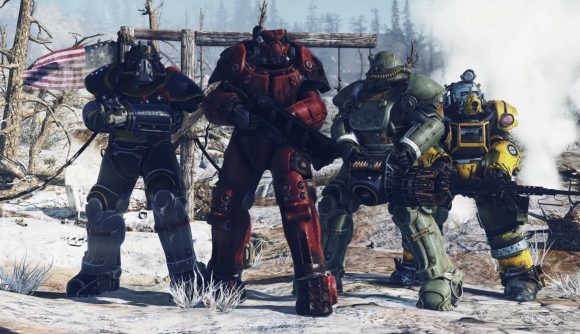 Today finally brought news of exactly how Fallout 76 PvP is going to work. Other players will be able to kill you even if you don’t want to get into a fight, but they’ll suffer some harsh punishments if they do. It seems Bethesda wants to split the difference between true penalties and allowing players the freedom to play how they want. If you want to get into a fight, you can start attacking a fellow player, but this happens at reduced damage. Todd Howard suggests this is something similar to a barroom slap fight before the real brawl begins. If somebody engages you, it’s up to you if you want to fight in true PvP, where rewards like experience and caps are on the line. PvP mode will also “normalize” your damage, so players aren’t too greatly separated by level and equipment. A player with power armour and a minigun will have an advantage against somebody with just a knife, but Howard says it won’t be impossible for the weaker player to win in that situation. But if you kill somebody who doesn’t actively engage you in PvP, you get no rewards – no XP and no caps. Instead, you become a “wanted murderer.” That means they’re marked on the map with a red star for everyone to see, and there’s a bounty on their head – and that cap bounty comes out of your own money if you’re killed. If you meet somebody who’s killed you, you can go after them for a revenge bonus – meaning you get double rewards. When you die, you only lose your junk. That is, the odds and ends you’ve picked up for sale and crafting over the course of the game. Items like your weapons and special armour are all safe. You can fast travel anywhere on the map when you respawn – the closest point to you and Vault 76 are both free, but you’ll have to pay a cost in caps if you want to go anywhere else. That cost will vary based on distance. Keep an eye out for the Fallout 76 release date. We’ll make sure you’re updated on all the info as it becomes available.